Supported by the IUF, the PepsiCo (Frito-Lays) Workers Action Committee continues to hold actions in defense of their members' rights. The Action Committee was formed last year in response to mass dismissals after workers formed a union at PepsiCo snack foods warehouses in West Bengal. Under pressure from an international campaign, management told workers they could return to their jobs - but only if they renounced forever their right to form or join a union! Action Committee members rejected these degrading and illegal conditions and are demanding unconditional reinstatement and guarantees they can exercise their rights. 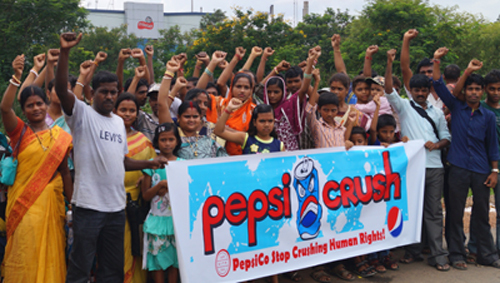 The Action Committee recently organized a protest in front of PepsiCo's Kolkata production plant, with the participation of their families and supporters, generating considerable attention as the plant is located very near to a major national highway. Supported by union action in India and by PepsiCo workers globally, the Action Committee also holds regular family and community events, boosting support and morale. The workers and their families have pledged to continue fighting: "We will never surrender our rights!"